The MPL4137 is an SRAM/EPROM and FLASHROM memory card, compatible with the G-64/96 bus. It provides 8 JEDEC compatible sockets for 1, 2 or 4 Mbit memory chips up to a maximum of 4 Mbyte. The bank selection and address range adjustment are easily made with a few jumpers. 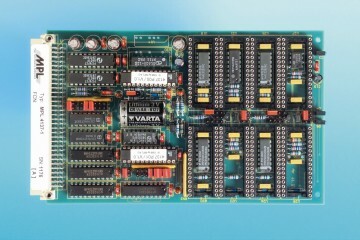 The card is designed for fast operation within a 16/32 bit system. The fully CMOS design guarantees low power consumption.